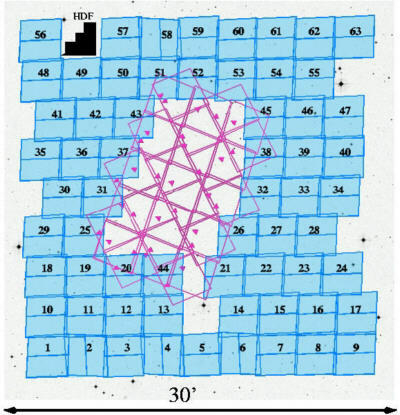 is a large-area (800 arcmin 2) two-color (F606W and F850LP) imaging survey with the Advanced Camera for Surveys on the Hubble Space Telescope. Centered on the Chandra Deep Field-South, it covers an area of ~ 28'x28', or about 120 HDF areas, to a depth of MAB(F606W)=28.5(5σ) for compact sources. In its central ~1/4, GEMS incorporates ACS imaging from the GOODS project. Focusing on the redshift range ~ 0.2<z<1.1, GEMS provides morphologies and structural parameters for nearly 10,000 galaxies where redshift estimates, luminosities, and SEDs exist from COMBO-17. At the same time, GEMS contains detectable host galaxy images for several hundred faint active galactic nuclei. The science goals, the experiment design, the data reduction, and science analysis plan for GEMS are described in Rix, et.al. 2004. The GEMS ACS data are located in the anonymous ftp area on archive.stsci.edu in the directory /pub/hlsp/gems/. To retrieve all data, ftp to archive.stsci.edu, login as anonymous and cd /pub/hlsp/gems. Utilizing previews created by GEMS team member Boris Haeussler, MAST provides a "browse" tool for the GEMS data. The GEMS SkyWalker tool, developed by AIP staff, allows you to view the entire GEMS color mosaic. The GEMS project has provided a table with useful information and links to cutouts of select objects, the previews of the original observations and to the final products (HLSP).